In 2018, we had a record number of 140 participants, and they were all very excited to share their research with you during this time of student-driven, inquiry-oriented learning. 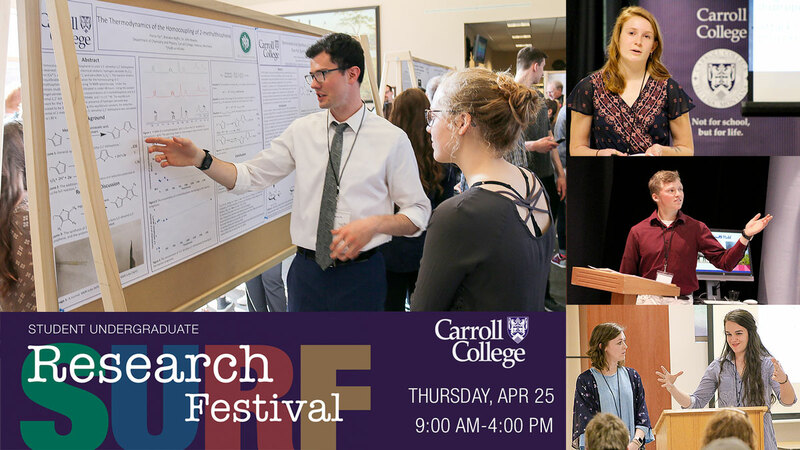 Carroll's Student Undergraduate Research Festival (SURF) is our annual research event taking place on Thursday, April 25th from 9am to 4pm (no classes on that day). This is a wonderful chance for Carroll College students to show off their amazing research — we welcome you come and view presentations from all disciplines! Questions? Dr. Eric Sullivan at esullivan@carroll.edu. Visit surf.carroll.edu for details, times, titles, names, etc. for the whole SURF schedule. Need the PowerPoint template for your SURF presentation? Download it here. For more information, visit the Presidential Inauguration website.